Great stuff Evan! I love the old-timey contaptions on his arm. The colour scheme is great too. Great use of colour, Evan! I don't like how it almost encourages me to rashly throw away my life, though. Punching dinosaurs in the face? I can't beat that! Awesome job as always, man. I'm pretty much being forced to buy war bonds at this point. That's how excellent and inspiring this is. 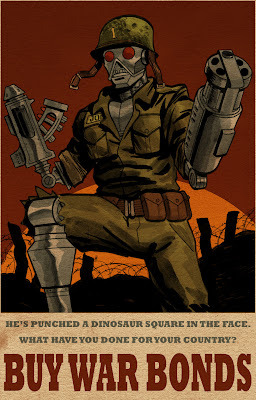 I would join the Army if they promised me I could punch dinosaurs in the face. In a heartbeat. Totally awesome illo Evan, and the copywriting is top notch awesome. excellent work, evan. i love the propaganda poster motif.